How Do I block / unblock a Baaz User? – Welcome to the Baaz Suggestion Box! How Do I block / unblock a Baaz User? 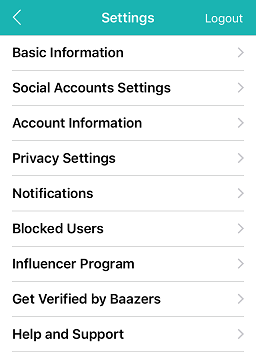 As a user you have the ability to block/Unblock other Baaz users. Once you block someone, that account can no longer see your posts on your Baazline, Tag ,send messages or Add you as a friend. 1. Go to this user profile page. 2. Tap on the menu icon on the top left corner of the screen. 3. Tap on Block at the bottom of the screen. 4. Tap on "Confirm" to block the user. 1. Click on the avatar, on the top right corner, and choose Settings from the drop-down menu. OR Go to your Profile settings page and click on Edit Profile on the bottom right corner of your cover image. 2. Click on Blocked Users. 3. find the User you want to unblock and click Unblock. 3. Tap on Block User at the bottom of the screen. 4. Select "Yes" to confirm user block. 1. Select on the Hamburger icon on the top left corner of screen and select Settings. 2. Select "Blocked Users" from the menu. 3. In blocked users window screen, Choose "UNBLOCK" to unblock the selected user. 2. Tap on the menu icon on the top right of the screen. 3. Tap on Block User. 4. Tap on "Ok" to confirm user block. 1. Select on profile page from the bottom task bar. 2. Tap on settings icon on the top right of the screen and go to select "Blocked Users" from the menu. 4. Tap on "Yes" to confirm user block. 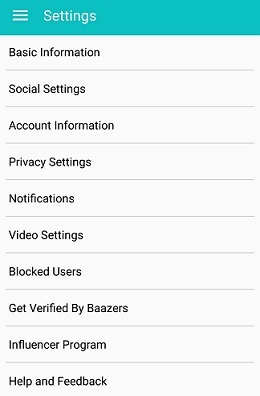 What is a Baaz profile? What personal information is shown on my profile? What personal information is hidden on my profile? How do I add or change my avatar? How do I add or change my profile cover picture? Can I report a user? How can I filter profile posts by networks? How can I filter profile posts by types? Who can post on my profile? What are the Social Networks that are shown on a profile? Why am I receiving email notifications from baazemail.com? Can I report a comment?